When you hear the word “fermentation,” what comes to mind? For most people, it’s wine. Or beer, or spirits. What—you don’t do alcohol? It’s still possible, even probable, that you have a fermentation fetish and don’t even know it. Fermentation is a metaphor for a new age: millions of microflorae living in symbiosis, disarming the dangerous, encouraging that which promotes health. Plainly speaking, fermentation is a way to preserve fresh food with live cultures. Biochemically, it’s the breakdown of carbohydrates by microorganisms—bacteria, yeasts and molds. That may not sound particularly appetizing, I’ll admit. But the practice of fermenting foods has been going on all over the planet for at least 9,000 years. Before the invention of the ice box (and, subsequently, the refrigerator), drying and fermenting foods were important methods of food preservation. Nowadays, people ferment foods primarily for enhanced flavor and nutrition. The result seems more like alchemy than chemistry. Wine has been around for at least 5,000 years. Fermented dairy probably predates that, first formed when milk was carried in sheep bladders. There’s evidence the transformative nature of fermented foods caused ancient peoples to approach them with reverence: Egyptians praised Osiris for beer. The Greeks thanked Dionysus for wine. In early Japan, miso breweries had shrines. The practice, a natural phenomenon, occurs widely. Wikipedia lists 140 various types of ferments found around the world. 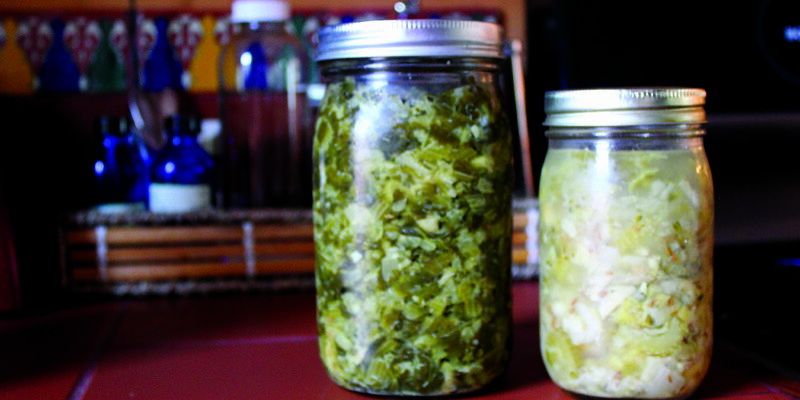 The art of fermentation (for it is an art more than a science; rarely do two batches turn out the same outside of commercial production) has been maintained through the years primarily by ethnic groups who find pleasure in their native foods, for instance, Koreans (kim chee), sauerkraut (Germans) and cured meats (Italians). Fermentation fell out of favor with the advent of the refrigerator and increased emphasis on centralized food production. With supermarkets and freezers, who needed cultured foods? In 2003, Sandor Ellix Katz published Wild Fermentation: The Flavor, Nutrition and Craft of Live-Cultured Foods (Chelsea Green). With this book, Katz started a movement that is changing the human microbiome. His The Art of Fermentation: An In-Depth Exploration of Essential Concepts and Processes From Around the World (2011, Chelsea Green) has seriously ignited the scene. Katz is the Pied Piper, the modern John Appleseed, of fermenting. Which of these everyday ferments do you consume? Except for cheese and bread, they are not products you’re likely to ferment yourself. Still, it’s good to know about them, and enjoy them! Coffee: In most coffee processing, beans are fermented in water prior to roasting to remove an insoluble coating . Chocolate: Until the cacao beans are fermented, dried and roasted, they don’t even taste like chocolate. This process also reduces bitterness and increases bioavailability. Cheese: Enzymes and microbes added to the milk transform the texture of the cheese and develop the flavor. Sourdough bread: is made with a starter—a flour and water mixture innoculated with developed yeasts and bacteria from a previous batch. Some of the beneficial bacteria is lost to heat when the bread is baked. Still, sourdough is the most digestible of breads. Meats: For sausages, salamis and other artisan meats, fermentation is what happens after curing. The natural, living process of fermentation can work on all manner of food. There’s plenty to purchase in the way of cultured foods nowadays: sauerkraut and pickles (purchase only from the cold case; pasteurization kills the good microbes, destroying most of the nutritional value) various beverages (kefir, water kefir, kombucha, kvass and more), the old standby yogurt; and soy derivatives such as tofu and tempeh. Natto, Vegemite/Marmite, pickled herring and chutneys are other ferments commonly consumed in other countries. 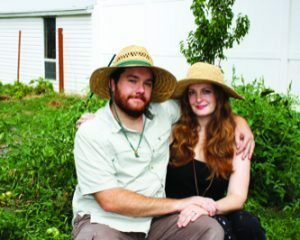 The contemporary urge to ferment may be a natural extension of the ever-growing interest in local food production and culinary creativity. This DIY kitchen magic is also collaborating with science. It’s about time, after years of promoting the notion that the only good bacteria was dead bacteria. But new knowledge about pre-and probiotics shows there’s an actual need to remedy damage done by extensive use of antibiotics and microbial soaps along with a decrease of fiber in our diets. There’s also the notion of terroir, as with grapes in making wine but in a broader sense a microbial terroir, where geography and climate conspire to mark your ferments with the the biology of your time and place. Katz encourages us to overcome cultural anxiety. “Do not be afraid. Do not allow yourself to be intimidated. Reject the cult of expertise. Remember that all fermentation processes predate the technology that has made it possible for them to be made more complicated,” he writes in Wild Fermentation. You could call it a fun form of food activism. This technique is also called lactofermentation. Fermented cabbage is called sauerkraut. Savoy cabbage with chile peppers is kimchi. Basically, it’s all what Sandor Katz calls “kraut chi”—the fermentation of any vegetables and spices you choose. Don’t forget pickles and fermented condiments such as salsas, chutneys, sriracha and ketchup. Note: While basic clenliness is expected, sterility is not. It’s really hard to screw up while fermenting vegetables. Technique: Chop up the vegetables. Sprinkle with salt and spices. Massage the veggies until the cell structure begins to break down and they release liquid. Pack into jars (or crock), continuing to work vegetables until there is sufficient liquid to cover. Leave a good inch of headspace. If liquid is not forthcoming, top off with water and a bit more salt. Cover and place out of direct sunlight. Check daily and, with a large spoon, tamp down the produce which will inevitably be bubbling up. Taste it, and refrigerate when its flavor suits you. Don’t rush—it will get better and better! The prep goes quickly. Then time is the true activator. A bit of whey speeds the process but is unnecessary. For kefir (pron. ke-feer) you need to purchase kefir “grains” from the cold case of a natural foods section; then you can maintain your own. (Unlike yogurt, which you can make with storebought yogurt as a starter). You may also find a friend who is already making kefir. Kefir is easier to make than yogurt, because temperature control is not an issue. It also is more nutritious, with two to three times the number of cultures and 20 different types of probiotics. Definitely worth the less effort! Technique: Mix the activated starter with milk in the jar. Cap loosely and let sit in a warm place till the mixture reaches desired thickness (8-24 hours). You can shake it periodically if you remember to. When it reaches a flavor and texture you like, strain out the grains to start another batch. NOTE: Instead of grains, with Body Ecology Kefir Starter there are are no grains to remove. Simply start a fresh batch with a few spoonsful of the kefir, as you would in making yogurt. The texture of this type is also very similar to yogurt. If you’re on a MAO inhibitor to treat depression, high blood pressure or other medical condition, you’ve been told to follow a special diet—one that, sadly, does not include any fermented products. 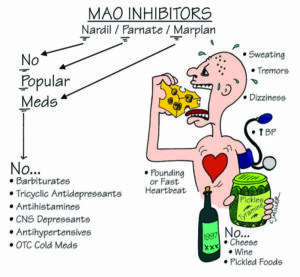 That’s because MAOIs remove your body’s ability to metabolize tyramine, resulting in migraine headaches and other side effectsx. Fermented foods are also naturally high in histamine, the compound that can trigger the signs of an allergy if your body lacks the enzymes for metabolizing it. ‘Bye-bye fermented foods, at least for a while. In the meantime, increase your fiber intake. Learn about (and taste!) all things fermented and cultured, including bread, cheese, yogurt, kombucha, chocolate and much more! Throughout the day, fermentation experts will demonstrate how cultured foods are made, as well as how you can make fermented foods in your own home. The mission is to help connect people with the history, benefits and important role that good bacteria play in our bodies and on the planet. Vendors include Abigail’s Oven, Caputo’s, Bread Riot, Yummchi, Mamachari Kombucha, Cru Kombucha, Drake Family Farms, Milk & Honey Yogurt, Heber Valley Cheese, Chocolate Conspiracy, Solstice Chocolate, Squatters, and more. Free. 300 S. 400 W.
This closing event of the 10th Annual Eat Local Week is presented by Urban Food Connections of Utah. CATALYST Magazine is the media sponsor. Come meet the Windsor Street flock!